Have you heard of fried green plantains? They are as popular in Latin America as French fries are in the U.S. – everyone eats them and they're on practically every menu. Whether you call them tostones, patacones, or plantain chips, these crispy little rounds make a mighty tasty snack or side dish. 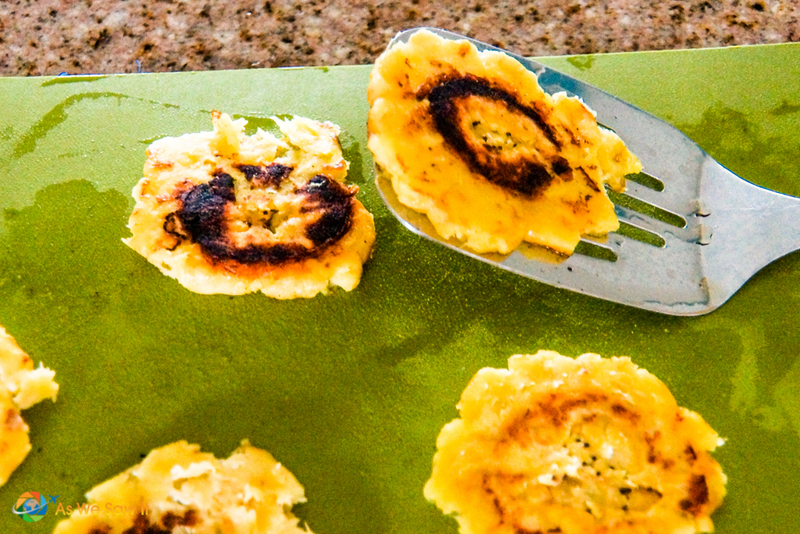 They are so delicious that we had to share our easy patacones recipe with you guys. We’ll be surprised if you don’t enjoy them as much as we do. And here’s a bonus: They are gluten free, full of nutrients, and vegan friendly. At least … that's what I read online. Having lived in Panama and Ecuador, we came to call them patacones. Pat-a-cone-ez. Four syllables that make my mouth water as they roll off my tongue. Whatever you call them, they eaten as a snack or side dish all over Latin America and throughout the Caribbean. And why not? They’re cheap, filling, nutritious, and easy to make. These crispy little rounds are so delicious that we had to learn to make them while we were in Panama. We think that recipes make a perfect travel souvenir. Sometimes I think patacones are even more popular than sancocho, Panama's national dish. Considering how often they are eaten, you might as well call them Latino french fries. But I don't think Latino fries sounds very catchy. These little guys may look like golden-brown discs of fried banana, but they’re not. They are starchy through and through, and leave just the tiniest hint of banana flavor after the swallow. They’re made from a fruit known as the plantain. Plantains are related to the curvy yellow fruit we all know and love. In fact their trees look identical. They look the same inside, too. But plantains are used differently and have so many health benefits that they are actually the 10th most important staple food in the world. if you haven’t eaten cooked plantains yet, you’re in for a treat. That's why we had to share our tostones recipe with you. Or plantain. You know what I mean. You should have seen the confused look on his face. They were so clearly (to him) plantains, not bananas, yet obviously the irate woman was completely clueless that such a thing even existed. As you might have guessed from my story, plantains stay green for a very long time and can easily fool the uninitiated. How do you tell the difference between bananas and plantains in the grocery store? Plantains are solid, heavier and have a more blocky shape. That's what you'll want for this recipe: plantains with a darker, gray-green color. If you find any in the grocery store that are yellowing, that is a sign that they are beginning to ripen, which means the starch inside is turning into sugar (in other words, they're getting sweeter). They'll be pretty much completely yellow for a while before they develop black streaks – just as dessert bananas do – and finally they turn black. The black ones are really sweet. Latinos use them to make a fabulously delicious sweet dish called maduros. But that's not what we're making today. Here’s a simple recipe for patacones. You can do step 1 ahead of time if you need to. Be aware though: You probably won't make them only once. They can be rather addicting. I've broken this down into micro-steps for clarity. Place 4 cups warm water into a large bowl. Stir in about 1 tablespoon of salt. Set aside. Cut plantains crosswise into 1-inch thick pieces. Remove plantain pieces from the water and blot completely dry with paper towels. Heat oil over MEDIUM heat until the oil is glistening. You’ll know it’s hot enough when a small “tester” piece of plantain sizzles. Place plantain pieces in the oil (don’t crowd the skillet; it’s better to do in batches if needed). Fry plantains 5-7 minutes, turning occasionally with tongs, until tender and just beginning to turn golden color. Remove plantain pieces with tongs to a flat, non-stick surface, such as a cutting board. Spray the bottom of a heat-proof glass tumbler or mug with non-stick cooking spray. Gently press each plantain piece with the base of the mug, flattening to ~1/4″ thickness. Small cracks are OK.
Reheat oil over medium heat and return flattened plantains to hot oil. Fry 3-4 minutes, turning occasionally, until plantains are golden brown in color. Transfer plantains to a plate with a fresh paper towel, but DO NOT BLOT. Sprinkle with salt & serve immediately, with your sauce of choice (optional). Enjoy these delectable morsels as a snack or a side dish. You can eat them with your fingers. They also make a delicious accompaniment to Panama's national dish (find our Panamanian Sancocho recipe here). Latinos serve them plain, salted, or with a variety of dipping sauces, from guacamole to garlicky mojo and ají to sweet and sour. We prefer to enjoy them with a sprinkle of salt; our daughter likes them with ketchup, which is very popular in Panama. I think it's a holdover from the days when the U.S. controlled the Panama Canal. In some countries, fried plantains are served topped with cheese as an appetizer, or with ceviche, pulled chicken or avocado salad. Venezuelans even use patacones as a sandwich filling! Try them any delicious way you like, then let us know what you think. If you enjoy cooking, here are some Amazon books you may like. We’ve not seen saba in our markets. I know it’s a banana, but what’s it like, have you ever prepared it? I have not cooked with it, but my mom-in-law made a soup with it in there, along with who knows what! It tasted good, that’s all I was concerned with! 🙂 The saba itself tasted pretty much like a plantain. It was softer, but probably because it was stewing for a while. Yes, I think most countries know them as tostones. Your lime-and-salt suggestion sounds delicious; it would be a variation on the salt and vinegar flavor I enjoy so much with potato chips. Will definitely try this out when I go to Latin America. The dips you described sounds absolutely mouth-watering! Turn about is fair play, Liz. I fully intend to seek out your sugar-laden fried saba when I go to the Philippines, and I’ll enjoy every bite of that decadence. Thanks for the tip. What kinds of bananas do you usually have in Kenya? You have covered all the patacones related things in a excellent manner. In Puerto Rico, we called them tostones. We eat them with garlic mojo (like you mentioned) or with mayoketchup (as the name implies, you mix mayo and ketchup, sometimes a hint of garlic is added). Some people like to use the plantain when it is a bit ripe to make the patacones (will result in a sweeter patacon). I prefer the regular recipe with green plantains. I don’t know which I prefer, the patacones/tostones or the sweet maduros. If calories weren’t an issue, I’d just eat them both. Well…just as you’d expect Cathy, the green ones are pretty starchy. You might prefer the ripe ones cooked with brown sugar, called maduros. I know we do! I love fried plantains and am always thrilled when I see them on a menu. My most recent encounter was on a cruise ship through the Panama canal. It’s great when cruise ships offer a sample of the local cuisines, isn’t it Rhonda? Did you have the opportunity to try any other Panamanian dishes while on the ship? It is delicious, Katy. We just wish it weren’t so high in carbs! Just based on these photos, these look simply delicious! I already love the fried banana chips that you can find in Southeast Asia, so I think I’d love these too. I don’t know if plantains are sold here in Singapore though. All the bananas you find in stores can be eaten raw. I’ll definitely keep an eye out for these when I visit Ecuador!! I think you’re right that plantains aren’t available in Singapore, but you do have a lot of other things that we don’t, so it’s hard to feel very sorry for you, lol. I’m familiar with the salted banana chips that they sell in the U.S. They are very much like potato chips in texture and flavor, but with a slightly banana undertone. Are your chips similar? I saw the plantains in the store and I’ve heard they are eaten fried, but I had no idea they are called Patacones. I’ve never tried them, of course, but I’m sure I would enjoy them a lot because they are fried. I love everything fried (although it’s so unhealthy! 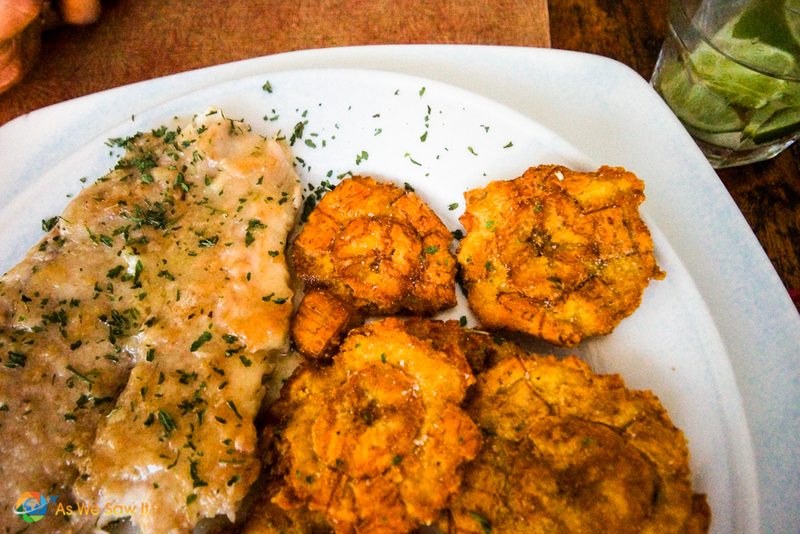 ), so I’m going to try this recipe as soon as I can get my hands on some plantains. I am a huge fan of fried foods as well, Anda. They are really easy to make, and if they weren’t so high in carbs we would eat them a lot. Plantains are easy to find, actually. Besides Latino markets, these days you can often find them in regular grocery stores wherever there is a large Spanish, African or Caribbean population. Thanks for the recipe. I pinned it to my food and drink board. Thanks for pinning it, Jan.